Lleyton Hewitt has come under fire. Tennis pro John Isner has taken a swipe at Lleyton Hewitt while defending coach Justin Gimelstob over accusations of violent behaviour. Gimelstob, who is now on the board of the Association of Tennis Professionals (ATP), has vowed to defend himself as he appears in court later this month for an alleged assault last Halloween. According to UK publication The Telegraph, Gimelstob reportedly hit venture capitalist Randall Kaplan in the face and told him: "I'm going to f***ing kill you." Kaplan said the incident was witnessed by his wife and two-year-old daughter. In a letter to the ATP player council, Gimelstob - a grand slam doubles champion who turned to coaching and broadcasting before dipping his toes in administration when his playing days ended - promised to fight the allegations. And Isner promised to stand by Gimelstob as he fought his legal battle. "Of course Justin is very close to me, as a friend and as a coach," Isner said on Wednesday. "But even if he wasn't, at the current time I would still support him because he's innocent until proven guilty. "We'll know the facts soon enough. It might not be a popular opinion, but as of now, I have to give Justin benefit of doubt." Justin Gimelstob (right) will have his day in court. Hewitt called on the ATP to "lead by example and do something about this" on Twitter when news of the allegations against Gimelstob broke last month. But Isner hit back at the Aussie tennis legend and Davis Cup captain, dragging up an ugly incident from his past, according to veteran ESPN tennis writer Peter Bodo. "I don't think (Gimelstob) should take a leave right now," Isner said, according to the ESPN report. "We don't know the facts yet. Hewitt doesn't know the facts, either. "He's the guy who was involved in his own nasty situation with (former tennis star) James Blake, and I'm not calling for his head, or for him to step down from working with Tennis Australia. He's being arrogant." Editor of Inside Tennis Magazine Bill Simons also reported Isner's Hewitt reality check. 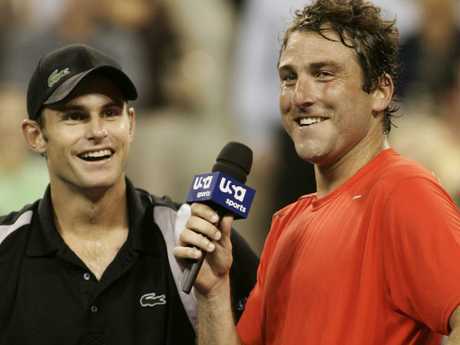 Isner was referring to an incident between Hewitt and Blake at the 2001 US Open, when the then 20-year-old was involved in an argument with the umpire that took a sinister turn. 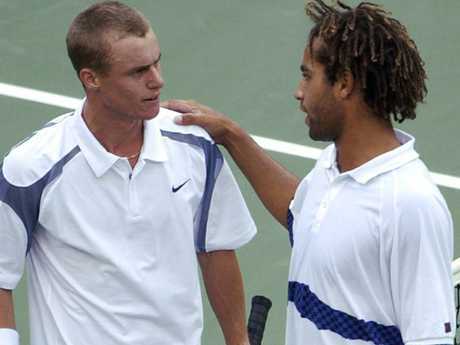 After being foot-faulted twice by a black linesman on crucial points in the third set, Hewitt was accused of dragging race into the situation by suggesting the similarity in skin colour of Blake and the official was playing a part in the decision to penalise him. "Look at him (the linesman) and tell me what the similarity is (with Blake)," Hewitt said. "I want him off the court. I've only been foot-faulted at one end. Look at what he's done." Hewitt defended himself in the aftermath of the clash, saying "there was nothing racial said out there". Blake, who was 21 at the time, gave Hewitt the benefit of the doubt. 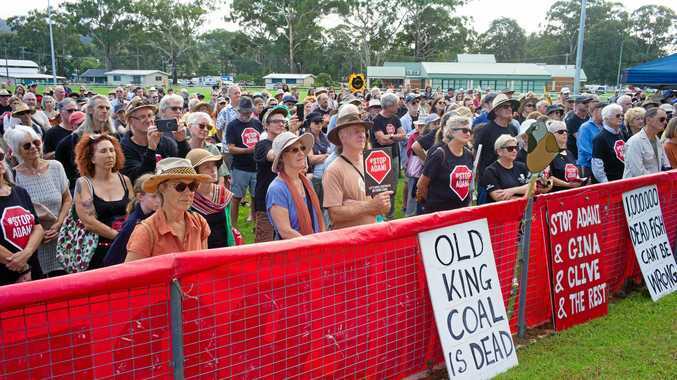 "It probably didn't even occur to Hewitt that I heard it," he said. "My reaction was to try to win the match. I didn't want anything to cloud my thought processes, I was just intent on playing my game." Hewitt was widely criticised for his conduct in the match, particularly in the US. Lleyton Hewitt came under fire at Flushing Meadows in 2001. Gimelstob turned himself into authorities last month and was released on $50,000 bail. He was dressed as a Top Gun pilot the night of the alleged incident. A police report attached to a November 1 restraining order contains photos of a bruised Kaplan, the LA Times reported. Kaplan told the court he and his family remain terrified of Gimelstob. "I am afraid for my life," Kaplan wrote, according to the LA Times. The disagreement between Gimelstob and Kaplan apparently revolved around Gimelstob's estranged wife, Cary, who Kaplan has remained friendly with. Cary Gimelstob filed a domestic violence restraining order against Gimelstob in 2016, alleging he "physically assaulted, harassed, verbally attacked and stole". Most of Gimelstob's success came in doubles and he captured mixed doubles grand slam titles at the Australian and French Open in 1998 with Venus Williams. He has coached a number of successful players since retiring and is an analyst for the Tennis Channel.